Our Shade Sails stand out because they have been made from the highest quality of materials and installed by the best sun shade sail installation company in San Diego. We also offer customers the opportunity to customize their designs to suit the landscape at their location. Our designs are developed by using high-quality premium materials that offer a optimal UV ray protection for an adequate shade. Our designs are unique and impressive. They can be customized to match your residential or commercial landscape, including providing shade for artificial playground turf areas and synthetic golf putting greens. We are confident in our ability to create designs that match your outdoor settings, playgrounds, school recreational areas, children childcare centers, community areas, outdoor sporting venues and shades for other commercial purposes. We offer a free quote on demand to cover the best designs that will uniquely complement your space. Our shade sails are perfect for your backyard patios and carports. Setting up our customized shades in these areas will transform spaces that were formerly being underutilized into the perfect space for reclining with your friends and family while being protected from the intensity of the southern sun. Our experience enables us to create all sizes and shapes of shades with different specifications complemented with an amazing aesthetic value that your friends and family will be impressed with. We can develop square-shaped designs or triangular shaped designs, and if you wish for shades created in other shapes, we will be more than happy to meet your needs and specifications accurately. Are you worried about what can fit into your available space? Give us a call, we will work with your space to accommodate unique modern custom designs. Do you need shade sails for residential or commercial property landscapes? We are ready to deliver the exact designs you need. Our team is experienced in creating the perfect shades to suit your landscapes. Our shades will keep you protected from the intense heat outdoors at all times. Our shades have been manufactured from high-quality materials. We exclusively use high tension fabric to create designs shaped according to your specifications and the space available. 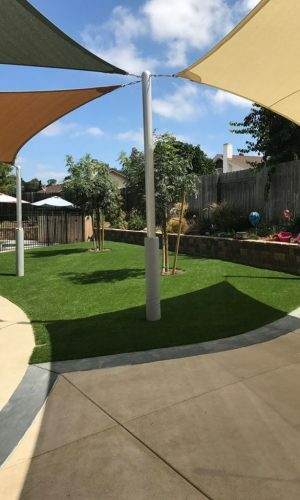 To get your free artificial grass estimate today, or if you have any questions about our great service, contact the professionals at the best sun shade sail installation company in San Diego.